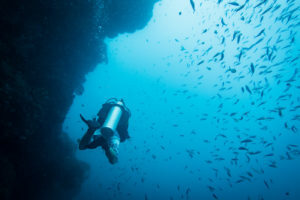 Bohol is now becoming increasingly famous in the scuba diving community. Indeed, the diving there is really interesting and varied. This destination is great for many things like the Coral, the numerous Pelagic fishes and Reef Sharks you can encounter as well as for superb wall dives. As it is located about 2 hours away from Bohol, This is a full day trip. This place is really great for wall diving with great chances to spot many pelagic fishes like Barracudas, Dogtooth Tunas and Giant Trevallies! You can also stay on the island in basic accommodation, perfect to plan a few night dives for great underwater macro pictures opportunities ;-). From December to June, you may have the chance to see schools of hundreds of Hammerheads Sharks! The best time to spot them is just after sunrise or just before sunset. Balicasag is a really beautiful small Island now declared as a Marine Sanctuary. It features superb Coral, healthy Reefs with a teeming reef life. There is also a resort on the island if you want to stay on it. It is also a very good snorkelling spot! The visibility is usually excellent around Pamilacan. The hard and soft Coral is really beautiful. It is a great place to see the gentle giants Manta Rays! You can also spot there lots of Pelagic fishes such as Barracudas, Dogtooth Tunas and Jacks. Pamilacan is famous to see Dolphins and Whales too ;-). It is a great place for critters and underwater macro photography. You can see there Ghost pipefishes and the weird looking Frogfish.